One thing that will really crimp your outdoor adventures is sore feet. A specific ailment that creates sore feet is plantar fasciitis. If you walk around all day without too much foot pain — maybe it feels like you bruised the ball of your foot — but wake up in the morning and have excruciating pain for the first fews steps you probably have plantar fasciitis. The pain is typically at the ball and/or heel of your foot. It is caused by inflammation where the plantar fascia, a ligament under your foot, attaches to the ball and heel of your foot. The inflammation is, in turn, caused by excessive tension in the ligament. That tension is often caused by flat feet. The ligament normally has the appropriate length for your feet with a normal arch. With flat feet, or a fallen arch, your toes want to be just slightly farther away from your heel while your plantar fascia wants to keep them the same distance apart. So, your foot wants to stretch out, but your ligament does not. This additional tension in the ligament pulls on the attachment points more than it should. You step down, the ligament pulls on the attachment points, you lift your foot and the tension drops. This constant yanking at the attachment points leads to inflammation and pain. At night, unless you sleep standing up, the ligament tightens up and can easily pull your heel and toe back into position. No problem, until you stand up and that tight ligament puts even more tension on those attachment points. Those first few steps really hurt! However, it doesn’t take too many steps before the ligament stretches again and you are back to the tolerable pain. However, while all this is going on, there is nothing that would lead to reduced inflammation so the pain continues. In my opinion, stretching the plantar fascia ligament is not a real solution. In the first place it’s the attempts your body has made to stretch that ligament that led to the pain. Is trying to somehow stretch it more going to help? I think not — at least not without a lot more pain. If you want to try it, you can use a device at night that pulls your toes back and toward your leg, like the one in the photo. The idea is that this will keep tension on the already stretched ligament while you sleep. This should help some because that tension will stop the stretch/shrink cycle and, hopefully, eventually, make the ligament stay a bit longer. The payoff is in the morning when those first few steps don’t hurt as much. However, the way I figure it, during the day the ligament will pretty much return to its prior condition and you’ll need to use the strap device every night for a very long time. My opinion on this is not based on actually using one of these things as I never have. I was able to resolve my issue with a combination of the other two approaches. A small percentage of people can’t get relief any other way and end up having plantar fascia relief surgery. The surgery typically involves cutting a bit of the ligament to reduce tension. It is not recommended until you have tried other approaches for at least six months and failed to get relief. My doctor advised me to try exercises that stretch the achilles tendon. He told me to stand on a stair step with my toes on the step and my heels hanging over the edge. Then, drop my heels down slowly and repeat. This puts tension on the calf muscles and the achilles tendon that runs up the back of the leg. 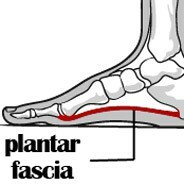 By stretching them, the idea is to give the plantar fascia a bit more slack. My physical therapist further advised that it is necessary to hold the stretched position for about a minute. A shorter hold allows the tendon to return to its normal length in short order. I found that I could achieve the same effect in the shower by leaning forward with my hands on the wall and my feet back and my heels flat on the floor. I also found that while in this position I could roll my feet outward, and raise my arch, to put even more tension on my calf muscles. I added pushups to the regimen to get some help with upper body strength. It seems to me that the warm water from the shower tends to relax the muscles to make this regimen even more effective. I have done this exercise everyday for years now. Of course if you want to spend money on it, there are a variety of exercise tools that work on stretching the achilles tendon, like the one pictured above (click the photo to learn more and to purchase the product if you wish). It allows you to rock your heel downward in the same way as if you were standing on the edge of a stair step as described above. I guess if you can’t find a stair step it would be helpful. This one is not as hard as it sounds and should be the first thing you try. Since low arches put more tension on the plantar fascia the pain can be immediately relieved by properly raising your arches. If you force the middle of your foot upward, your heel and toe must get closer together — just a little bit — but often enough to do the job. The first arch supports I tried came from the shoe store. When I put them in my shoes and stood up, I swear 80% of the pain was gone immediately. My doctor told me custom inserts were well worth the expense. However, my podiatrist suggested I try Dr. Scholl’s® Custom Fit® Orthotic Inserts first. These are not really custom designed for an individual foot, but they do offer several options, one of which fit my foot pretty well. Getting the correct insert involved a trip to the local WalMart where they have a machine that measures the pressure at points around your feet when you stand on the device in your stocking feet. The device tells you which option will work best for you and it worked for me. It virtually eliminated the pain I had when walking around during the day and over a few weeks the inflammation went away so I could stand up in the morning without pain. If you don’t want to use inserts, you may be able to find a shoe that offers you the correct arch support. The ASICS Gel-Foundation 8 Running Shoe did the job perfectly for me. However, I found that the uppers wore out too quickly. Perhaps the new and more expensive replacement, ASICS Gel-Fortify Running Shoe , will be stronger. I have never found hiking boots or shoes that offer me the arch support I need so I continue to use the Dr. Scholl’s inserts with them. Another option you could try is a compression stocking or band that wraps around your foot at the arch as shown here (again, click the photo to learn more). Rather than pushing your foot upward like a shoe insert, these pull your arch upward toward the top of your foot. The effect upon your arch is the same, but they may not be comfortable enough to wear inside a shoe. While proper arch supports can relieve much of the pain immediately, resolving the inflammation that causes the pain can take awhile. I found a combination of arch support and achilles tendon exercises took several weeks to completely eliminate the pain. Using shoes without the proper arch support can quickly cause the inflammation to return, so be patient and resolute in following whichever regimine you choose. When my plantar fasciitis returned after doing some calf strengthening exercises (up and down on tip-toes), my physical therapist recommended, first that I stop those exercises, then that I try soaking my feet to reduce the inflammation. This is a process that involves setting up two pans, one with hot water and one with ice water. First soak your feet in the hot water, not too hot – you don’t want to scald your feet, for thirty seconds or so, then move your feet to the ice water for another thirty seconds. Repeat this process until the hot water is no longer hot. I did this once or twice a day for a week or ten days and the pain was gone. For more on my journey through various kinds of foot wear, see my article on EXPLORE! the eMagazine for Adventure and Exploration. Great information here for those suffering from plantar fasciitis . While I was a massage therapist we treated this very often. You mentioned in your article that you aren’t keen on stretching the ligament further as that is the reason for the pain in the first place but in my experience that is exactly why it needs to be lengthened. I addition to your solutions above one might try rolling their feet on a tennis ball once or twice per day. This will achieve both ligament stretching and arch support and formation plus you get to decide what level of discomfort you can tolerate. I agree about the ligament needing to be lengthened, but I think stretching it to accomplish that is more of a problem than a solution – at least in the short term. The only way I can think of lengthening the ligament without stretching it in a way that would pull at the attachment points would be surgery. Careful use of a tennis ball could lift the arch and relieve pain that way. Seems like if you put the ball under the ligament to try to stretch it, it would be very painful and, I suggest, not very effective. I can’t think of any way to stretch the ligament without a lot of pain in a home setting. I never tried using a tennis ball so I don’t know whether it hurts or not – anyone?